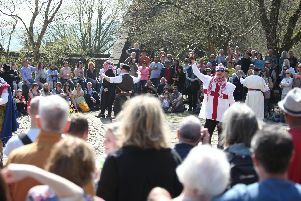 The streets of Hebden Bridge will come alive with dancing, busking, storytelling, workshops and street performers from May 13-15 with the annual Roots Festival. Among a brilliant line-up of acts is mercury music award nominees, Kathryn Williams and one half of the Magic Numbers, Michele Stodart headlining on Friday evening at The Birchcliffe Centre with support from The Hayes Sisters. Jess Morgan will be performing there on the Saturday, alongside Amy Wadge and Pete Riley, Plumhall, Roger Davies, Steve Tilston and Jez Lowe. John Palmer Acoustic Band and Rory McLeod and The Familiar Strangers will be at The Trades Club on Saturday evening plus Brian Toberman, Charlie Carr and Dave Nelson, Catfish Skillet plus more in the daytime too. There is a wonderful Bluegrass Day on Sunday at The Birchcliffe Centre featuring, Dude Coopers, 309s, Backyard Burners, Grove Bluegrass Band, Catfish Skillet, Murston Bapchild and the Braxton Hicks. Sunday evening’s finale at the Machpelah Mill, welcomes former Seahorses front man, Chris Helme, for a ‘Night of the Troubadours’ with special guests Terry Logan and Duende Dj’s. The Shaggy Dog Storytellers are here to perform the many tales over the weekend, Keith Donnelly brings us his brand new family show ‘I Wish I Was a Monkey!’ with an animal mask making workshop afterwards at Machpelah Mill. Can the Mountains Love the Sea? A Brand New Adaptation of the Marriage of Njord and Skadi by British Award for Storytelling Excellence Winner Tim Ralphs, Supported by Peter Findlay with The Last Wish of Jonah Jones, featuring live music by Robert Orange. Late Night Saucy Stories with Tim Ralphs & Storyman creator Peter Findlay and to finish, Afternoon ‘T’ with Keith Donnelly ‘An hour or so of Music Hall: Tunes & Tales, Tea & Macaroons. ‘The Word on the street’ is a literary stroll through the streets of Calderdale and beyond with award winning poets Terry Simpson & Winston Plowes plus special guest appearances. Beautiful voices can be heard at St James’ church, as 7 local choirs; Three Valleys Gospel Choir, Sailah, The Hebden Bridge Georgian Folk Singing Ensemble, Satteli – Swiss Folk duo, Calder Valley Voices, Corista and Remingtons (Barber Shop Choir) come together to perform on Friday evening. flavour who perform Traditional Dance Music and Old-Time tunes and Tenderhooks String band on Sunday. Come and meet the wonderful Sheffield Giants and Moaner Lisa, who are out and about on Saturday greeting our wonderful guests. There is a wonderful mix of arts, crafts and artisans showing their work at the Town Hall. lFull price tickets available at £40 for all three days. Go to http://www.hebdenfolkroots.org.